We are learning more and more about the complexity of the interactions between land covered by vegetation and the atmosphere. We have known for a long time that changes in canopy properties may have substantial effects on the climate, both locally and globally. However, we still lack reliable estimators of the full cascade of events (feedback) that are a consequence of simple changes in vegetation properties. We are working on this aspect as we carry out the FLEX campaign in Italy. 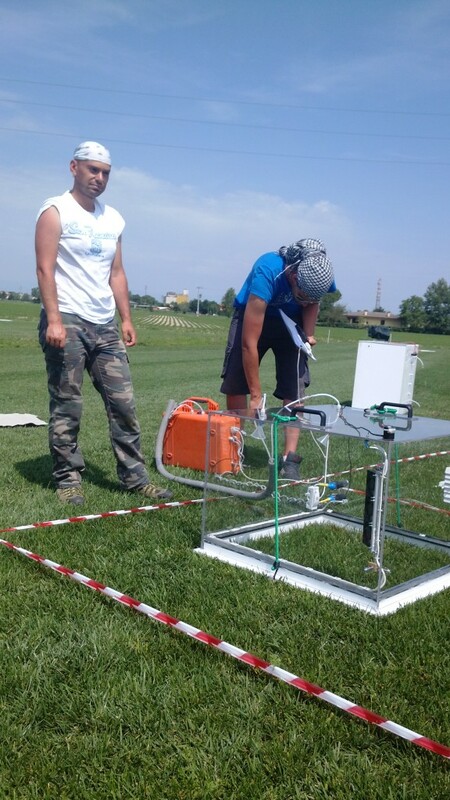 We used an antitranspirant on grassland to reduce stomatal conductance and we are modifying the albedo of the grass by spraying a white inert kaolin powder on large plots. The antistranspirant caused a rapid increase in the skin temperature of the canopy, clearly detectable with a ground-based infrared camera. We the same effect in the first quicklooks from the airborne thermal sensor. If antitranspirant closes the stomata, we should observe less transpiration – but a warmer canopy should transpire more as transpiration is driven by the difference in temperature between the air and the leaf. So will we observe less transpiration or will we see homeostatic compensatory effects, at the end of the story? In theory, if we reduce transpiration, we might also reduce carbon uptake of the canopy, i.e. reduce its photosynthetic rate. In which case, the emission of fluorescence should also be affected. Will Hyplant finally detect any change in fluorescence? The kaolin treatment decreased the temperature of the canopy. This is rather obvious, as a white reflecting surface does reduce the amount of solar energy absorbed by the vegetation and, with this, its radiative load. But will this change also mean that transpiration & photosynthesis are modified? In theory, steady-state fluorescence scales with absorbed light (APAR, absorbed photosynthetically active radiation). Will Hyplant detect concurrent changes in light absorption, reflectance and fluorescence? We are looking forward to putting together and processing the extremely large amount of data we are still collecting in Latisana, Udine, Italy. Post from: Franco Miglietta (Cnr-IBIMET, National Research Council Institute of Biometeorology), 23 June 2014.